Wearing bright colours can seem intimidating, but what if it could improve your mood? A study from the Vrije Universiteit in Amsterdam reported adults felt happier around the colours yellow and green. Sunshine and green fields? Count us in. 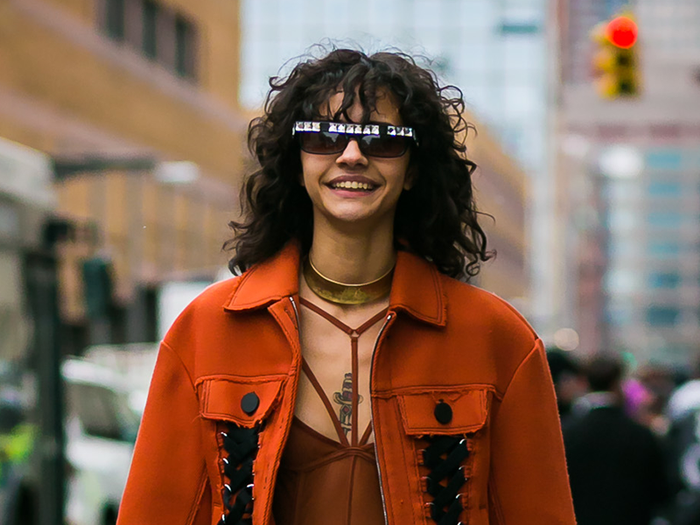 Find our favourite street style looks sporting the hues, and shop our attitude-boosting picks below—we swear we felt a little more content after just scrolling through this story. The appeal of statement trousers? All you need to complete the outfit is a simple tank. Green lace has never looked better. Lesson learned: canary yellow pairs well with a tropical floral print. Pair a mint dress with bright accessories for a colourful effect. This outfit has all the usual suspects found in a model-off-duty outfit (leather jacket, borrowed-from-the-boys shoes), but the addition of an unexpected green A-line skirt adds a unique spin. The beauty of this yellow pleated dress makes us emit a petite fashion sigh. We stand corrected: green and red can look cool (not Christmas-like) together. We wouldn’t normally call an outfit joyful, but that’s just what this sunny yellow ensemble is. A malachite-print top is a sophisticated way to wear the colour. Sheer lace skirts are having a moment—we’re grabbing one in this sunny hue. It doesn’t get more luxurious than a Rochas tote. Have any weddings to attend this summer? This yellow frock will be your go-to dress. You can always count on Dannijo for an incredible statement piece. Normally we would be inclined to get these strappy sandals in black, but there’s something unexpected about the yellow, no? This is the kind of skirt that gets compliments. Something about these sunglasses looks utterly opulent. A onesie for adults? You know we’re wearing it all weekend long. Now this is a blogger collaboration we can get behind. ?Now, check the corners of that mouth–upturned aren't they? Share what your happy hues are in the comments below!